Dispatches instructions through the RISC layer. The dispatcher is the instruction semantics entity that translates a high-level architecture-dependent instruction into a sequence of RISC operators whose interface is defined by ROSE. These classes are the key in ROSE's ability to connect a variety of instruction set architectures to a variety of semantic domains. Dispatcher objects are allocated on the heap and reference counted. The BaseSemantics::Dispatcher is an abstract class that defines the interface. See the Rose::BinaryAnalysis::InstructionSemantics2 namespace for an overview of how the parts fit together. Definition at line 2071 of file BaseSemantics2.h. Shared-ownership pointer for a Dispatcher object. Definition at line 2115 of file BaseSemantics2.h. Implemented in Rose::BinaryAnalysis::InstructionSemantics2::DispatcherX86, Rose::BinaryAnalysis::InstructionSemantics2::DispatcherM68k, and Rose::BinaryAnalysis::InstructionSemantics2::DispatcherPowerpc. Lookup the processor for an instruction. Looks up the functor that has been registered to process the given instruction. Returns the null pointer if the instruction cannot be processed. Instruction processor objects are managed by the caller; the instruction itself is only used for the duration of this call. Replace an instruction processor with another. The processor for the specified instruction is replaced with the specified processor, which may be the null pointer. Instruction processor objects are managed by the caller; the instruction itself is only used for the duration of this call. Given an instruction, return the InsnProcessor key that can be used as an index into the iproc_table. Set an iproc table entry to the specified value. The iproc object will become owned by this dispatcher and deleted when this dispatcher is destroyed. Obtain an iproc table entry for the specified key. Get a pointer to the RISC operators object. Definition at line 2167 of file BaseSemantics2.h. Get a pointer to the state object. The state is stored in the RISC operators object, so this is just here for convenience. Definition at line 2171 of file BaseSemantics2.h. The prototypical value comes from the RISC operators object. Definition at line 2174 of file BaseSemantics2.h. Returns the instruction that is being processed. The instruction comes from the currentInstruction method of the RiscOperators object. Definition at line 2180 of file BaseSemantics2.h. Return a new undefined semantic value. Definition at line 2185 of file BaseSemantics2.h. Return a semantic value representing a number. Definition at line 2195 of file BaseSemantics2.h. The register dictionary defines the set of registers over which the RISC operators may operate. This should be same registers (or superset thereof) whose values are stored in the machine state(s). This dictionary is used by the Dispatcher class to translate register names to register descriptors. For instance, to read from the "eax" register, the dispatcher will look up "eax" in its register dictionary and then pass that descriptor to the RiscOperators::readRegister operation. Register descriptors are also stored in instructions when the instruction is disassembled, so the dispatcher should probably be using the same registers as the disassembler, or a superset thereof. The register dictionary should not be changed after a dispatcher is instantiated because the dispatcher's constructor may query the dictionary and cache the resultant register descriptors. Definition at line 2214 of file BaseSemantics2.h. 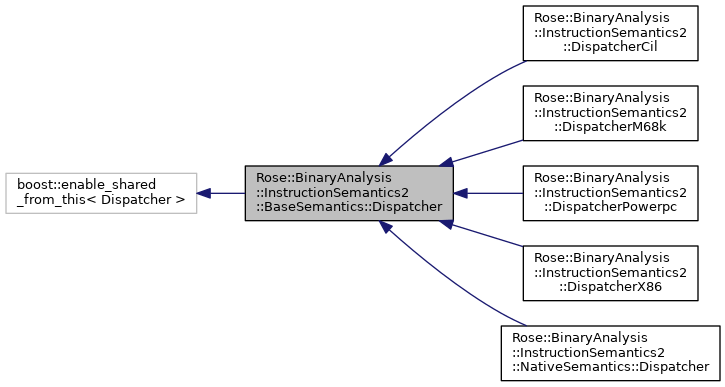 Referenced by Rose::BinaryAnalysis::InstructionSemantics2::DispatcherPowerpc::create(), Rose::BinaryAnalysis::InstructionSemantics2::DispatcherM68k::create(), and Rose::BinaryAnalysis::InstructionSemantics2::DispatcherX86::create(). Reimplemented in Rose::BinaryAnalysis::InstructionSemantics2::DispatcherX86, Rose::BinaryAnalysis::InstructionSemantics2::DispatcherM68k, and Rose::BinaryAnalysis::InstructionSemantics2::DispatcherPowerpc. Definition at line 2217 of file BaseSemantics2.h. Lookup a register by name. This dispatcher's register dictionary is consulted and the specified register is located by name. If a bit width is specified (nbits) then it must match the size of register that was found. If a valid register cannot be found then either an exception is thrown or an invalid register is returned depending on whether allowMissing is false or true, respectively. Property: Width of memory addresses. This property defines the width of memory addresses. All memory reads and writes (and any other defined memory operations) should pass address expressions that are this width. The address width cannot be changed once it's set. Definition at line 2234 of file BaseSemantics2.h. Returns the instruction pointer register. Property: Reset instruction pointer register for each instruction. If this property is set, then each time an instruction is processed, the first thing that happens is that the instruction pointer register is reset to the concrete address of the instruction. Definition at line 2250 of file BaseSemantics2.h. Definition at line 2251 of file BaseSemantics2.h. Update the instruction pointer register. Causes the instruction pointer register to point to the address following the specified instruction. Since every instruction has a concrete address, we could simply set the instruction pointer to that concrete address. However, some analyses depend on having an instruction pointer value that's built up by processing one instruction after another. Therefore, if we can recognize the register state implementation and determine that the instruction pointer registers' value is already stored, we'll increment that value, which might result in a concrete value depending on the semantic domain. Otherwise we just explicitly assign a new concrete value to that register. Returns a register descriptor for the segment part of a memory reference expression. Many architectures don't use segment registers (they have a flat virtual address space), in which case the returned register descriptor's is_valid() method returns false. Increment all auto-increment registers in the expression. This method traverses the expression and increments each the register of each register reference expression that has a positive adjustment value. If the same register is encountered multiple times then it is incremented multiple times. Decrement all auto-decrement registers in the expression. This method traverses the expression and increments each the register of each register reference expression that has a negative adjustment value. If the same register is encountered multiple times then it is decremented multiple times. Returns a memory address by evaluating the address expression. The address expression can be either a constant or an expression containing operators and constants. If nbits is non-zero then the result is sign extended or truncated to the specified width, otherwise the returned SValue is the natural width of the expression. The expression can be a constant, register reference, or memory reference. The width of the returned value is specified by the value_nbits argument, and if this argument is zero then the width of the expression type is used. The width of the address passed to lower-level memory access functions is specified by addr_nbits. If addr_nbits is zero then the natural width of the effective address is passed to lower level functions. Writes to an L-value expression. The expression can be a register or memory reference. The width of the address passed to lower-level memory access functions is specified by addr_nbits. If addr_nbits is zero then the natural width of the effective address is passed to lower level functions. Definition at line 2074 of file BaseSemantics2.h. Referenced by get_register_dictionary(), and set_register_dictionary(). Width of memory addresses in bits. Definition at line 2075 of file BaseSemantics2.h. Reset instruction pointer register for each instruction. Definition at line 2076 of file BaseSemantics2.h.